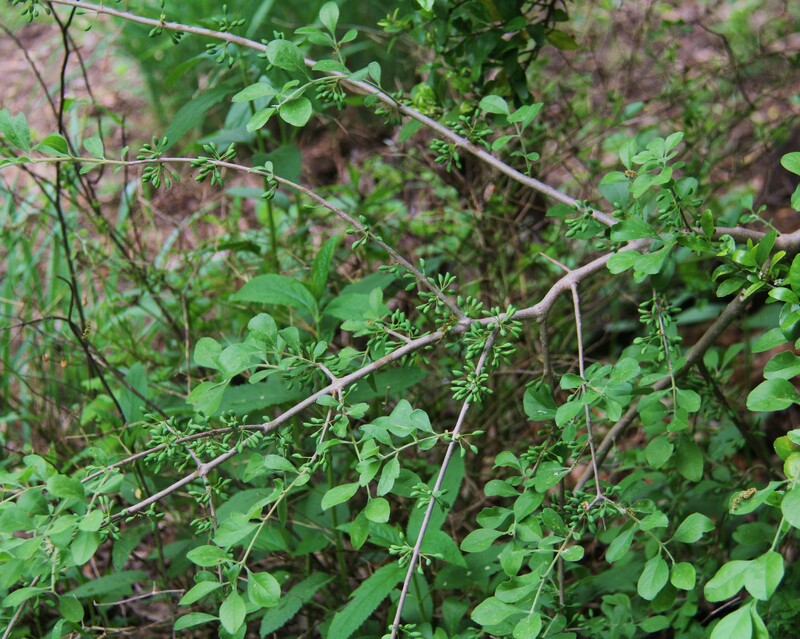 Elbowbush.Tiny green berries turn deep blue and quickly eaten by birds. Native small shrub, easy to grow. 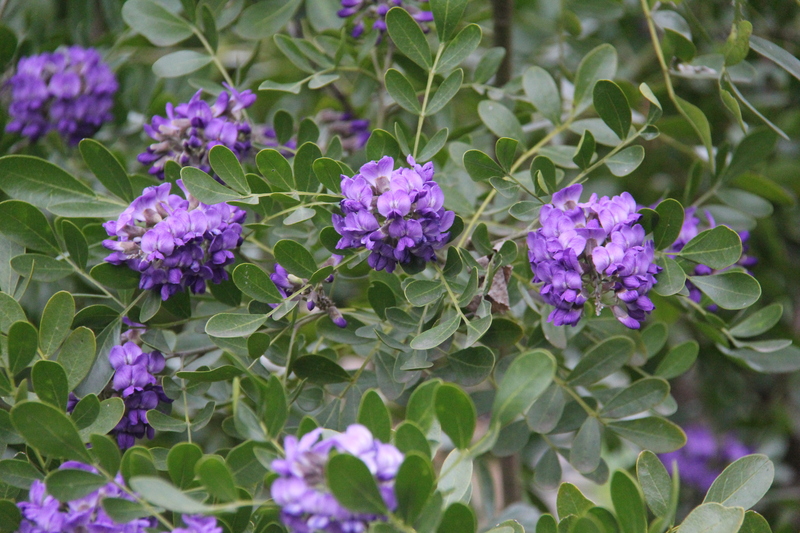 Mountain laurel, native. Available in nurseries, all of the plant is poison to livestock. Deer resistant of course. Brown seed pods in the fall are pretty. Evergreen. Eves necklace. Delicate foliage. Grows happily as a small understory tree or in mostly full sun. 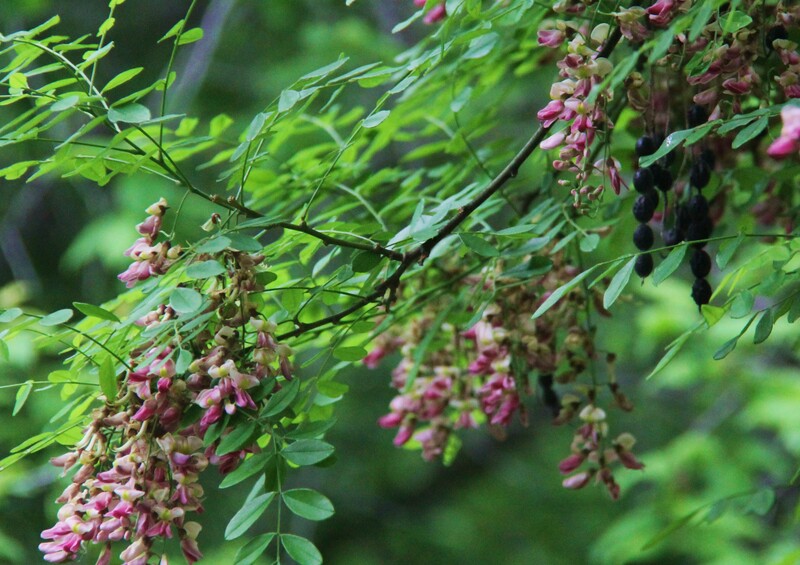 Blooms become long dangling black “beads.” Indians used the beads. A few beads are visible in upper right hand corner of this pic. Mexican plum. Long lived small tree. Easy to grow. Fruit small, dry, and tart but makes tasty jam. I always look forwared to spring. The newly emerging growth of the trees and shrubs is just so beautiful- at least to me. The tiny new leaves shimmer like little emeralds when there is a gentle breeze and the sun is shining. But there are bright and shiny (colors) of some plants such as the pomgrante tree and the old fashioned Nandia. Some evenings I just stand near the trees or shrubs and marvel at how pretty the colors are. Only nature can produce such beauty. I have tried to do justice to the colors of new spring growth but it just isn’t like seeing the array of colors in person. So here are a few pics of some of the shrubs that are blooming and some that are covered in berries. My yard is un-kempt for a reason. It is more attractive to the birds and other wildlife. (It is also less work. I have a helper for my animals about 2-3 days a week and he and my son help with basic trimming and some mowing of a few grassy areas) Fall and early spring make this property a chore with all the leaves that HAVE TO BE RAKED. The leaves are added to the compost heap. I said goodbye to the little cat in the pics above this past Monday. I actually had a little story and in my haste I managed to delete all that I had written. Oh well, I suppose it was not all that good anyhow. I was having difficulty putting into words, my feelings about what I consider a necessary evil. I know that euthanasia is the humane thing to do for an animal that no longer has any quality of life. But I have had many pets over the years euthanized and it never gets any easier. Coley lived in my house for 15 years and during that time she became a part of my life along with my other favorite and older pets. Actually I have been sad for the past several weeks because I could see her demise slowly approaching and then the last 3 days her time with me went ever so fast. Coley was cremated and her ashes scattered over the vast property of the crematory. I know that her spirit lives on.